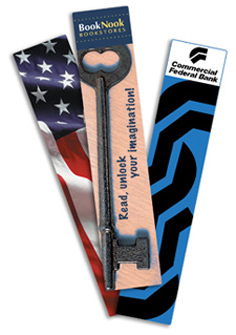 Bookmarks are the ideal promotions for educational institutions, public libraries and bookstores, but can also be used in many other settings. Bookmarks are .018" thick and coated with a high gloss laminate for a brilliant finish. The standard size is 2"x7", but Plastic Works can accomodate a variety of sizes and shapes.